Here we are at the season finale of Kitchen Nightmares which of course for me is a bummer because I love this show and EMC are huge fans of Gordon Ramsey. 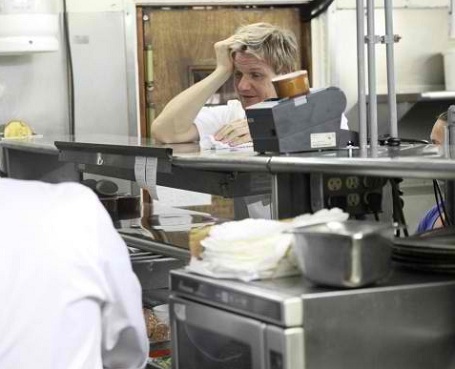 Luckily though we go from Kitchen Nightmares right into Master Chef. We did not get a chance to review the first season of Master Chef last year so I’m looking forward to it this year. In addition I have a few more episodes of Kitchen Nightmares to throw on here as my dvr had mono for a couple weeks and did not record some of my shows. Grab a beer and your favorite crawdad and lets head to New Orleans to Oceana. Last week was twins, this week we got just plain brothers. Don’t worry folks these brothers are not only brining back the George Michael stubble look but they are also crazier than our main man Charlie Sheen. Sorry Charlie we had to throw you in the mix at some point. We also have a red cheeked angry head chef thrown into the mix creating a wonderful red cheeked, gold chained, stubbly, greasy haired anger tornado. Good luck Gordon! Gordon visit’s a double nightmare at Capri in Eagle Rock, Ca. Why is it a double nightmare? The owners are twins. Unfortunately for us and Gordon they are identical twins. You know already we are going to be forced to endure twin jokes, trading names, acting like each other, etc, etc. The best twin humor however will be dealt of course by Gordon. We will have twin insults, twins yelling and most important in any kitchen nightmare, twins crying. So on to Capri in Eagle Rock. Mikey and I started this blog mostly because we were bored and unemployed. Now we’re neither. In the interim we’ve managed to eat some good food, some not so good food, and meet a ton of really cool people. Beware. There be spoilers ahead! We have finally reached the end for Season 5 of Hell’s Kitchen and I gotta say, it’s about time. This has been a rough season to watch, mostly because of the lack of talent and the abundance of the mentally challenged. Let’s kick it off with a recap of last week. I’ve learned my lesson with Hells Kitchen and didn’t bother posting a Hell’s Kitchen article last week. Knowing ahead of time that they always do the most to stretch it out, I thought it would be a wasted article and as usual (except for the time I jumped that rod iron fence in baggy shorts) I was right.